Continue helping the child look a person in the eyes and state his first and last name. 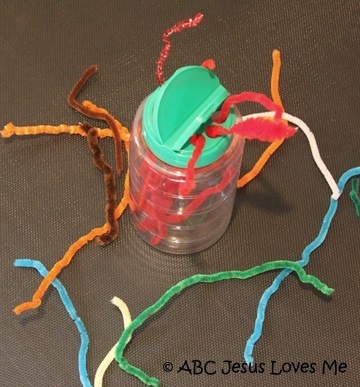 Pipe Cleaner Threading - Using an empty Parmesan cheese container or other cylinder container, demonstrate for the child how to thread pipe cleaners into the container. A Parmesan cheese container allows for three sizes of holes (without lid, pour, and sprinkle). Begin with larger holes and work toward smaller.